George R. R. Martin is the #1 New York Times bestselling author of many novels, including those of the acclaimed series A Song of Ice and Fire: A GAME OF THRONES, A CLASH OF KINGS, A STORM OF SWORDS, A FEAST FOR CROWS and A DANCE WITH DRAGONS --- as well as TUF VOYAGING, FEVRE DREAM, THE ARMAGEDDON RAG, DYING OF THE LIGHT, WINDHAVEN (with Lisa Tuttle) and DREAMSONGS Volumes I and II. 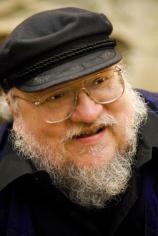 He is also the creator of THE LANDS OF ICE AND FIRE, a collection of maps featuring original artwork from illustrator and cartographer Jonathan Roberts; THE WORLD OF ICE & FIRE (with Elio M. García, Jr., and Linda Antonsson), and FIRE & BLOOD, the first volume of the definitive two-part history of the Targaryens in Westeros, with illustrations by Doug Wheatley. As a writer-producer, he has worked on "The Twilight Zone," "Beauty and the Beast," and various feature films and pilots that were never made. He lives with the lovely Parris in Santa Fe, New Mexico. Centuries before the events of A GAME OF THRONES, House Targaryen --- the only family of dragonlords to survive the Doom of Valyria --- took up residence on Dragonstone. FIRE & BLOOD begins their tale with the legendary Aegon the Conqueror, creator of the Iron Throne, and goes on to recount the generations of Targaryens who fought to hold that iconic seat, all the way up to the civil war that nearly tore their dynasty apart. What really happened during the Dance of the Dragons? Why was it so deadly to visit Valyria after the Doom? What were Maegor the Cruel’s worst crimes? What was it like in Westeros when dragons ruled the skies? These are but a few of the questions answered in this essential chronicle, as related by a learned maester of the Citadel. Now on its final voyage, the historical steamboat Natchez is known for her super-powered guest entertainers. But after the suspicious death of a crewmember, retired NY police detective Leo Storgman decides to make this incident his personal case. His findings only lead to a growing number of questions. Is there some truth behind the ghostly sightings of the steamboat’s first captain Wilbur Leathers? What secret does the current captain seem to be hiding? And could the Natchez be ferrying mysterious --- and possibly dangerous --- cargo onboard? Taking place nearly a century before the events of "Game of Thrones," A KNIGHT OF THE SEVEN KINGDOMS compiles the first three official prequel novellas to George R. R. Martin’s ongoing masterwork, A Song of Ice and Fire. These never-before-collected adventures recount an age when the Targaryen line still holds the Iron Throne, and the memory of the last dragon has not yet passed from living consciousness. This new anthology of 16 original stories by some of science fiction’s best writers --- edited by #1 New York Times bestselling author George R. R. Martin and award-winning editor Gardner Dozois --- turns back the clock to a more innocent time, before the hard-won knowledge of science vanquished the infinite possibilities of the imagination. Travel back in time to a planet that never was but should have been: a young, rain-drenched world of fabulous monsters and seductive mysteries. This lavishly illustrated volume is a comprehensive history of the Seven Kingdoms, providing vividly constructed accounts of the epic battles, bitter rivalries and daring rebellions that lead to the events of A Song of Ice and Fire and HBO’s "Game of Thrones." In a collaboration that’s been years in the making, George R. R. Martin has teamed with the founders of the renowned fan site Westeros.org --- perhaps the only people who know this world almost as well as its visionary creator. GAME OF THRONES mastermind Martin joins with award-winning editor Dozois to curate this collection of 15 all-original sf stories that hark back to the genre’s golden age, when works like Ray Bradbury’s THE MARTIAN CHRONICLES embodied a fascination with the interplanetary colonization and particularly the idea of ancient, doomed life on the red planet. In the aftermath of a colossal battle, the future of the Seven Kingdoms hangs in the balance --- beset by newly emerging threats from every direction. In the east, Daenerys Targaryen, the last scion of House Targaryen, rules with her three dragons as queen of a city built on dust and death. But Daenerys has thousands of enemies, and many have set out to find her. As they gather, one young man embarks upon his own quest for the queen, with an entirely different goal in mind. In the latest Wild Cards mosaic novel, we get to know the hardbitten world of Manhattan's Fifth Precinct --- or "Fort Freak," as cops and malefactors alike call the cop-shop where every other desk sergeant, detective and patrol officer is more than human.